"For me, it's about not letting motherhood stop me from making choices"
With a childlike aura and a constant smile on her face, Doris Wong Wai-yin is the opposite of a tortured artist. Known for utilising humour throughout her work, whether dark or political satire, and as a person who doesn’t take herself too seriously, Wong has shifted her outlook and now looks at life anew thanks to motherhood. 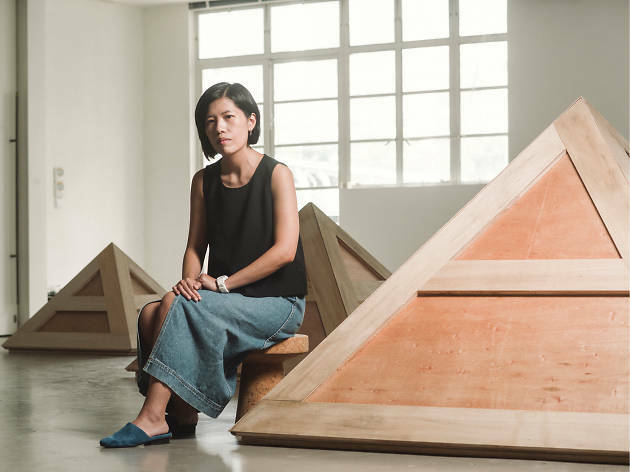 After taking a five-year hiatus to focus on her family, Wong is back on the art circuit with a brand new solo exhibition at Spring Workshop titled Without Trying. says Wong. The exhibition, curated by longtime friend and director of Spring Workshop, Christina Li, is largely inspired by the transformation Wong experienced as a mother. The show also explores the identity crisis that many women around the world struggle with: juggling the role of wife, mother and working woman. Through a mix of installation, paintings and video art, Wong uses her refocused curiosity towards the world to let go of the emotional and psychological burdens of the past and to move forward and embrace all her identities without any fear or hestitation. Wong has created many politically inclined artworks and installations in the past, including live performance art involving unknowing participants – one of whom turned out to be Legco member Leung Kwok-hung – passing around a gold coin to question people’s value system. But with parental responsibility has come a new perspective and motherhood has prompted Wong to think about her own identity and personal struggles. The various artworks and installations on display are focused on how Wong deals with those obstacles. The video art in the exhibition has to do with the idea of recalibrating her new identity and tackling her problems, which includes stomping on foods and standing in 22cm thick platform shoes just to be taller than her husband (fellow Hong Kong multi-disciplinary artist Kwan Sheung-chi). The audience should also pay close attention to the titles of her work. Many of them act like mantras and contribute to the general theme of reincarnation and overcoming fear. 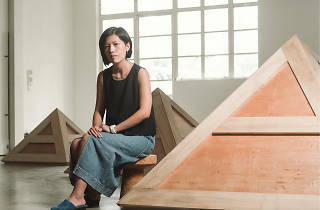 Held at Spring Workshop, one of the many emerging art lofts in Wong Chuk Hang, the exhibition is designed akin to a journey with Wong herself. At the beginning, viewers are welcomed by an open space of installations displayed together to create landscape scenery. The shift into expanded installations demonstrates Wong’s move away from small paintings. Then, as the artworks move into a corridor with videos and paintings on the walls, the spacing allows the audience to feel closer and more intimate with the artist.